Jukepot is the new video slot from NextGen Gaming. It is a 5×3 reel, 243 ways to win video slot set in a fifties diner theme. 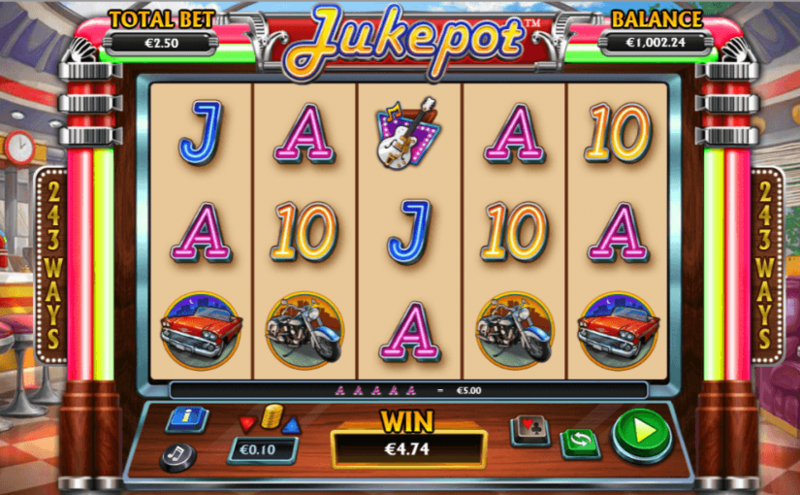 Jukepot’s big features are its wild reels and sticky reels. At random, wild reels can appear on any reel of the slot. This turns the entire reel into wild symbols to connect bet lines. There is also the awesome sticky reel feature. At random, any number of reels, between 2 and 5 reels can become stuck together and whatever symbols they spin, they will both spin the same reels, meaning that you’ll receive a majority of a bet line in one spin. The Free Spins feature will land you 10 free spins as well as a lock reel spin with at least 2 adjacent reels locked!